From not knowing a single other food blogger at the start of the year, I now know many and count them amongst my friends. Who would have thought that the Bord Bia food blogger event back in May would have been such a launching pad for the bloggers in Ireland to start organising their own events, meet‐ups, workshops and even the Irish Food Bloggers Association? Two bloggers I’ve come to know, both in the virtual and the real world, are Aoife of The Daily Spud, who in turn introduced me to Adrienne of Gastroanthropology, a fellow expat who lives in London. When I heard that Adrienne was organizing a blogger Christmas cookie exchange, I quickly signed up and wasn’t too surprised to see that from all the participants, Adrienne had arranged things so that I sent a recipe to her and received one from Aoife. Making Aoife’s shortbread was the perfect way to pass an afternoon with the kids when we were all stuck at home last week from the snow, and they were a welcome treat to have with a cup of coffee for me and hot chocolate for the kids. Given how many new people I’ve met because of blogging in 2010, I can’t wait to see who I might meet in 2011. You could also use boneless, skinless thighs or breasts; if using breasts, just cook them a little longer. I’ve only made the chicken and sweet potatoes from this menu, but if you want to make the rocket (arugula) salad and Portugese tarts as well, you can see the complete menu here. If you made the whole menu, it would be a fantastic spread for entertaining — but if you can actually pull it off in 30 minutes like the title promises, I tip my hat to you. Preheat the oven to 400°F (200°C). Put a large griddle pan on a high heat. Put the chicken thighs on a plastic chopping board, skin side down, and slash the meat on each one a few times. Drizzle with olive oil and season, then put on the hot griddle pan, skin side down. Cook until golden underneath, then turn over. 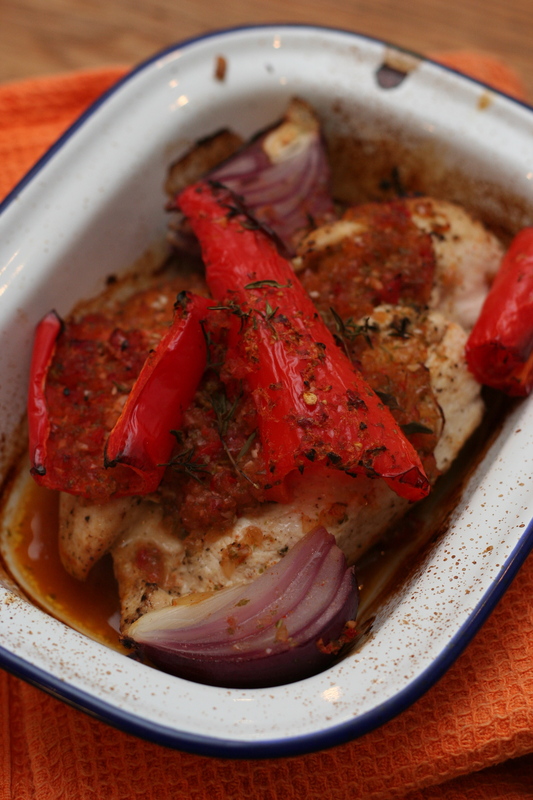 While the chicken is cooking, make the piri piri sauce. Add the onion, garlic, chillies, paprika, vinegar and Worcestershire sauce to a blender or food processor. Add the zest of 2 lemons and the juice of 1 lemon. Add a good pinch of salt and pepper, the large bunch of basil and a splash of water. Blend until smooth. Add the peppers to the griddle pan. Turn the heat down to medium and keep moving the peppers around. Turn the chicken over. Pour the piri piri sauce into a snug‐fitting roasting tray. Lay the peppers on top of the sauce and push to the side. Add the chicken to the roasting tray with the sauce. Scatter over the sprigs of thyme, then put the tray into the oven. Cook for 20 to 30 minutes, or until cooked through. Sprinkle over some chopped fresh cilantro to serve. Wash the potato and sweet potatoes and halve lengthways. Put them into a large microwave‐safe bowl with half a lemon. Cover with cling film and put into the microwave on full power for 15 minutes. (If you don’t have a microwave, simply boil the potatoes on their own until tender.) Once the potatoes are cooked through, use tongs to squeeze over the cooked lemon. (Or if you haven’t used a microwave, add the juice of the half lemon to the potatoes.) Add the chiles, cilantro and feta. Season to taste with salt and freshly ground pepper, mix everything together and serve. With two stir crazy children helping me make these cookies when we were all stuck at home last week because of the snow, I streamlined Aoife’s recipe to just use packaged ground almonds instead of toasting whole almonds and grinding them myself. I went ahead and used the zest of an entire orange instead of just half an orange, and I also didn’t have any amaretto in the house, so I used almond extract instead. 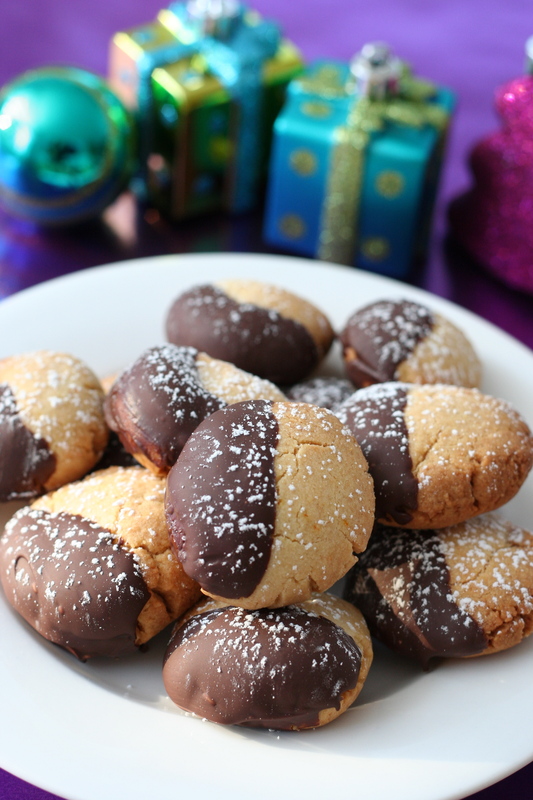 Aoife also suggests two variations by replacing the orange zest with some espresso powder and/or replace the almonds and amaretto with hazelnuts and Frangelico. Whisk the plain flour, rice flour and salt together in a medium bowl. Add the ground almonds and whisk again. In a separate bowl, a stand mixer or a food processor, beat the butter until light and fluffy. Add the honey, almond extract and orange zest to the butter and beat well. Gradually incorporate the flour and almond mixture into the butter. When done, you should end up with a ball of dough that will be slightly crumbly and tacky to the touch. Scoop heaped teaspoonfuls of the dough into the palm of your hand, roll into balls, then place on the baking sheet and flatten slightly, either using the palm of your hand or the base of a glass. You should end up with little discs around 1 inch wide and 1/4 to 1/2 inch high. Bake for 20 to 25 minutes, or until the biscuits are just starting to darken at the edges. Allow to cool slightly for about 2 minutes, then toss the biscuits in the icing sugar and leave to cool fully on a wire rack. If you fancy dipping the biscuits in chocolate, then chop the chocolate finely and either melt in the microwave (zapping it until barely melted) or in a heatproof bowl set over a saucepan of hot (not simmering) water. Once melted, dip half of each biscuit in the chocolate and leave to set on a wire tray. When cool, dust with some more icing sugar and enjoy with your Christmas tea or coffee.